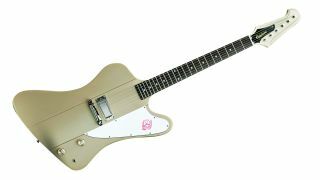 Nobody knows guitars quite like blues hero Joe Bonamassa, and now you can get one of his finest signature models, the Epiphone ‘Treasure’ Firebird-I, for a bargain figure. The good folk at Musician’s Friend have slashed $200 off the asking price for this rare ’bird, taking the grand total down to $599, from $799. That’s quite a deal, especially when you consider the model is based on Bonamassa’s original ’63 Firebird, and packs a mahogany body with thru-neck construction, single ProBucker FB720 pickup and luxurious Polymist Gold finish. One thing’s for sure: this deal is certainly cheaper than that.